Rafael Toral is a musician and artist. Born in Lisbon, he has been performing live since 1984. Having attempted to study music, he realized his path was one of exploration and discovery, to which conventional music teaching was irrelevant. He learned acoustics, electronics and music writing, having started to write music on paper after his former fascination with graphic scores. In 1994, Wave Field determined a shift in composing methods, taking from then on sound itself as the basic matter for all music, thus rendering his work unwriteable. Considered later in the 1990's by the Chicago Reader to be "one of the most gifted and innovative guitarists of the decade", he has been working on the possibilities of ambient music (variable attention listening process) and improvisation with higher levels of risk (using instruments or systems that behave in unpredictable ways), among other things. Developing solo work since 1987, with a strong focus on how sound phenomena, ambient sound and artistic fruition are inter-related and weaving a unique blend of references such as ambient, rock, chance and improvisation, Toral recorded several solo CDs, two with the MIMEO orchestra and two with com No Noise Reduction, an experimental project with long time friend and collaborator Paulo Feliciano (see discography). He has performed throughout Europe, Japan, Canada and extensively in the USA, as well as with Sei Miguel, Phill Niblock, Rhys Chatham, John Zorn, Thurston Moore, Dean Roberts, Christian Fennesz, Lee Ranaldo and Jim O'Rourke. He has also produced rock bands (Pop dell'Arte, Tina and the Top Ten, Supernova, Toast, Clockwork), presented video and multimedia installations and recorded music of Phill Niblock and John Cage. In 1996 Toral collaborated with Rhys Chatham as curator and coordinator for 100 guitarists in Lisbon for his performance An Angel Moves too fast to See. In 1998 he participated in the Acqua Matrix show at Lisbon’s Expo’98, collaborating with David Toop and an international creative team, composing a piece for remote-controlled boat horns. Later in this year he becomes a member of the Mimeo orchestra. In 1999, with Paulo Feliciano, built the “white cube”, a light generating device interactive with sound spectrum, and participated as guest in Sonic Youth's record NYC Ghosts and Flowers. 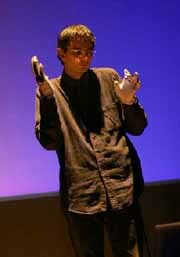 In 2000, again with Paulo Feliciano, participated, with the mixed-media installation Toyzone (modified electronic toys, custom relay circuits and multiple sensors), in “Sonic Boom – the Art of Sound”, an exhibition at the Hayward Gallery in London, alongside Christian Marclay, Pan Sonic, Ryoji Ikeda and Brian Eno. In 2003 Toral produced the first Anthology of Portuguese Electronic Music, and in early 2005 he collaborated with Alvin Lucier, as assistant to setting up his "Empty Vessels" installation at Serralves Museum, Porto. Having produced video pieces since 1994, used in both live performances and installations, his visual output has been increasing. His installations usually have an interactive and unpredictable behavior, often using processing of generative feedback systems, such as Toyzone or Echo Room, a piece for delayed feedback random sound filtering, recently installed at the ICC in Tokyo. Between 2002 and 2004 he operated a radical change in most aspects of his music practice and thinking, launching the so-called Space program - a work program establishing approaches to real-time performance and use of silence new to his past work, and including projects for many live pieces and recordings.